Soapstone is a beautiful experience in itself, making your home look beautiful and cozy, whether used for bathroom flooring or wall cladding purposes, or as countertop surfaces. Being a metamorphic rock formed due to the movement of tectonic plates and transformation due to temperature, it is found only in some places. Even though there are stones like granite, marble, limestone, and travertine, you’ve ample reasons to choose soapstone over other natural stones. Soapstone remains soft and comfortable to touch, unlike granite which feels hot or cold to touch depending on the surroundings. Looking subdued, even when polished in comparison with granites, they have more to offer than meets our eyes. Due to their distinct origin, soapstones feature rich vein patterns and color variants of dark green, gray, and black. Even though you can polish them and get some shine, over time they lose luster and look dull. Many sellers claim, soapstones are non-porous and resist stains. It’s true to an extent when it comes to acidic orange and citrus juices, oil, or water. However, as they naturally look tanned in due course, protecting their looks becomes necessary. Coating the soapstones with mineral oil gives a darker tone, but ensures uniform looks for longer periods. Soapstones are non-porous, and easily resist accumulation and growth of microbes on their surfaces. 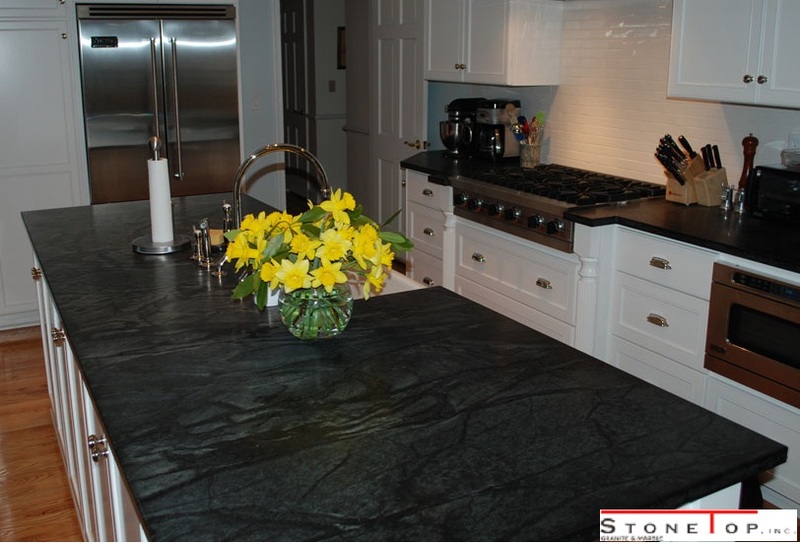 Soapstone is a healthier candidate as a countertop which needs less maintenance. As these natural stones contain talc, they are soft; their softness varies based on the occurrence and variety. For architectural purposes, the ones with talc percentages of around 30% are used, as they are harder enough to resist deforming forces for some extent. Soapstones retain and release temperature gradually, thus making excellent materials for purposes such as lining stone hearths, insulating floors, cooking vessels, whisky stones, etc. This also protects them against heat-induced damage, giving them an advantage over other natural stones for use as kitchen countertops. An outdoor fireplace is a great way to cozy up with your family, especially during the winter months! With Christmas fast approaching, people would just love to decorate their outdoor fireplaces with lightings, and place Christmas tree and furniture next to it. Those who do not have plans to build outdoor fireplace would wish to get themselves one fast! However, as a stone hearth made of mortar takes three months to set you can opt for ready-made ones like metal globe, gas fire pits, or handmade stone hearths without mortar sealing. 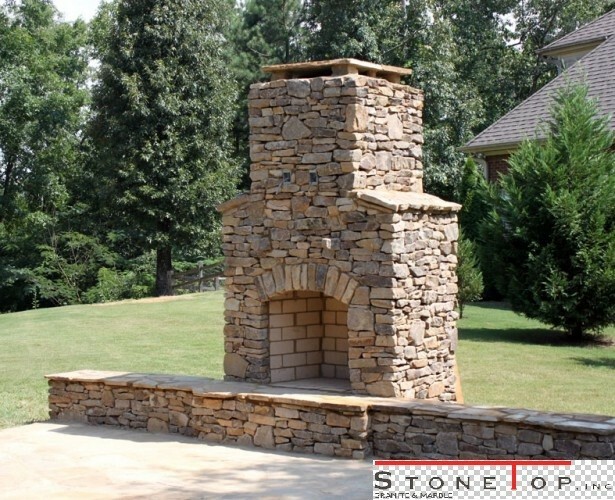 If you are thinking of building one for the future, use these tips to plan and build a nice stone outdoor fireplace. Here are some tips to consider while building your fireplace. Building a right sized hearth is very important, because it ultimately should serve the purpose. The hearth should not look dwarfed or imposing in front of your mansion or tiny house! Do you have kids in your home? Whether yours is a family of geeks or those who love Victorian constructions, there is a theme for everyone! An outdoor fireplace for a home with kids can be built with stone, concrete, and mortar smoothened to allow seating around the hearth. Bright colors cheer up the place, whereas pillows and cushions ensure comfortable seating. Geeks would love the hearth made of metallic forms that resemble minions or characters, laptops, scientific fiction gadgets, or anything alike. Brick fireplaces may also go well for this group which will make the place look zippy. A gas burner can be used instead of woods for cleaner surroundings. Victorian setting may flaunt refined looks despite featuring a rugged appearance for outdoor settings. Natural stones like sandstone, granite, limestone, and travertine can be used to match your flooring and wall tiles. Storage space for firewood can be provided beside the hearth for convenience. Before building an outdoor furnace find out which location suits better. If your backyard is spacious you will have many choices to make, but ensure the smoke does not enter your or neighbor’s home. Get the permission of local authorities for using wood in the hearth. Hearth next to a backyard swimming pool with wooden chairs spread in front can be a great idea! Take the assistance of your gas company to locate the gas line in case you want a cleaner furnace with gas connection. Dig a foundation of 6 inch or 1 foot depth as per requirements (bigger hearths need deeper foundation) and fill concrete mixture in it. Level the mixture and allow it to set for 24 hours. Spread the mortar paste on it and lay concrete slabs covering the surface within the hearth boundary. Build the three hearth walls (left, back, right) using fire bricks placing them ¼ inch apart from each other and sealing using a mixture of high-temperature mortar and the normal one. Provide support and construct a chimney walls as per your design choice. Make sure the chimney is taller by two feet compared to nearby constructions to avoid darkening. Close the top of the chimney with spark arrestor with a little gap to let the smoke leave the hearth. Use attractive stones such as sandstone or granite and build hearthstone. You may also use stone veneers on the chimney walls for a beautiful look. Now draw the gas connection line into the furnace and check if it is sealed and works properly. If you want to use only woods you may skip the last step.